What an exciting and busy week...and how the time is flying by! Welcome sketch lovin' friends! A good friend asked if I would do several stamping projects with a group of teachers that are getting together this weekend...so, I'm finishing up the last of five projects we'll be doing...four cards and a gift box. Even though I'm keeping the projects kind of easy, I'm ready for a break from paper cutting! LOL! One of the projects is a tent topper Christmas card featuring Dasher, and since the stamp was sitting on my desk, I decided to use it for this week's sketch sample for The Sweet Stop. Creative Nugget: If you've been following my blog for a while, you know that pink and green is one of my favorite color combinations...even for Christmas. I stayed true to the sketch, layering Neenah Solar White, Old Olive, Pink Pirouette, and Eskimo Kisses DP by Basic Grey. A Martha Stewart Snowflake Border Punch was used at the bottom of the pink layer. All panels were sponged with either Peeled Paint, Spun Sugar, or Aged Mahogany Distress Ink before being stitched to the card base. The The Patterned Pines were stamped in Old Olive and Dasher was stamped in Versafine Onyx Black. A torn layer was added for snow and Stickles applied for sparkle. This panel was pierced because my little Sew Mini would not sew through all the layers! 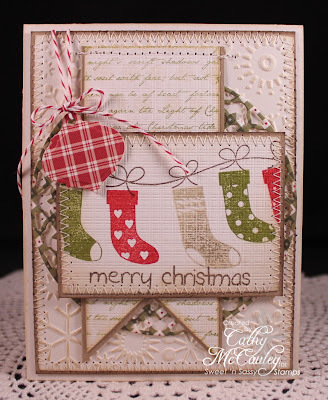 The sentiment is from an adorable snowman set by Sweet 'n Sassy Stamps called Welcome Jesus. A torn layer and Stickles were added to the sentiment panel as well. 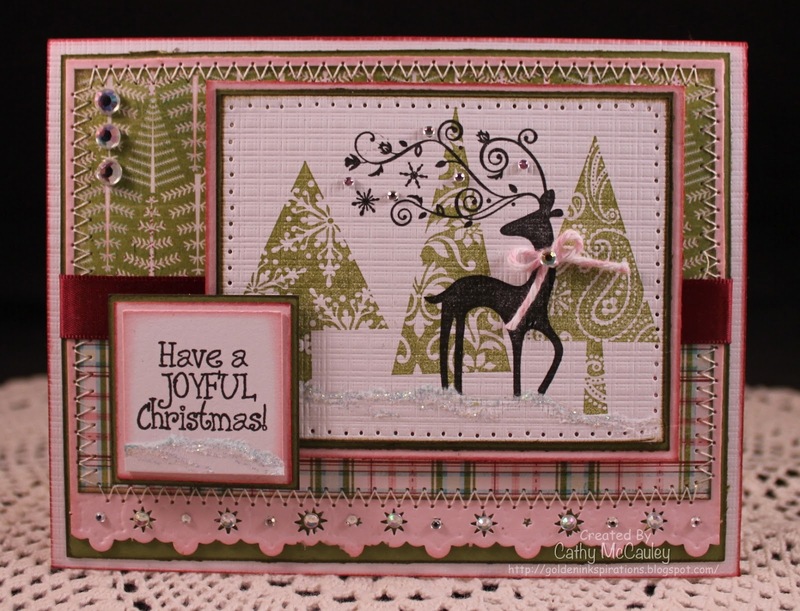 A little bling and a bow for Dasher complete the card. It's hard to see in the photo, but this card really sparkles! Stop by and see more fabulous samples by the other Sugar Babies. As always...we can't wait to see how you use the sketch this week! Thanks to all who participated in our Design Team Call last week. The entries were wonderful...I'm so glad I don't have to be the one deciding who the next Sugar Baby will be! Thanks so much for stopping by...have a wonderful weekend! I'll be anxiously waiting to see if I've made the next round of the Last Card Standing Contest! Hello friends! 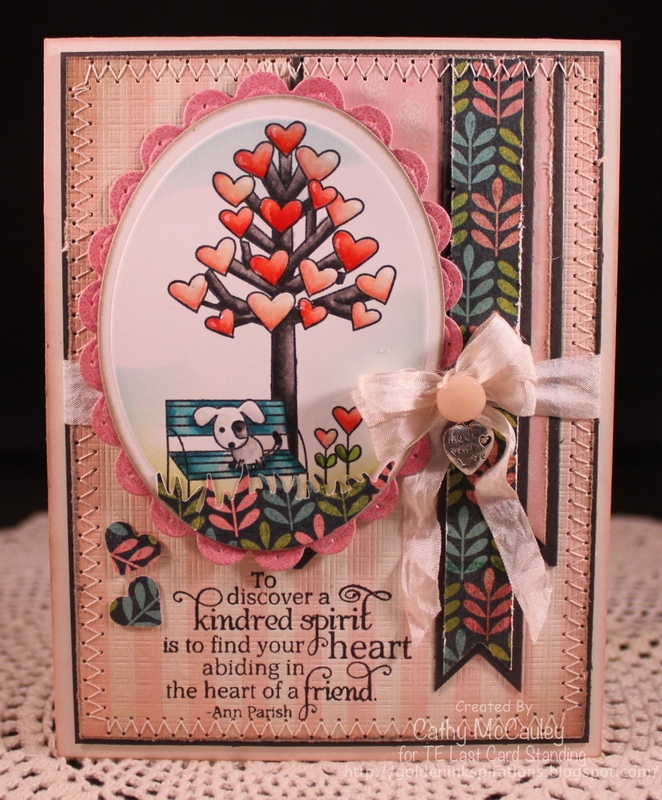 Just a short post for you today...I had just won a stamp set by Taylored Expressions and noticed on Taylor's blog that she was having a contest for a guest designer position and some fabulous prizes, so I decided to enter the Last Card Standing Contest! Well...SURPRISE...I made the first cut and am one of fifteen finalists! As you can tell from my blog header...I love hydrangeas and couldn't wait to color this gorgeous Hydrangea Bouquet by Taylored Expressions! So now it's on to round 2 and I just finished my next entry for the contest. We had to use a friendship theme for our card and at least one image by Taylored Expressions. This tree image from the Love Grows Here stamp set, which was the set I won, was perfect. The sentiment is from the Together Silhouettes clear stamp set by Sweet 'n Sassy Stamps. What do you think? We'll have to wait and see if it makes the next cut! I'll keep you posted! Hello sketch lovin' friends! It's time for a new sketch at The Sweet Stop...and, we have an exciting announcement to make! We're having an Open DT Call! The Sugar Babies are looking for a new design team member for the November 2012 to January 2013 term. 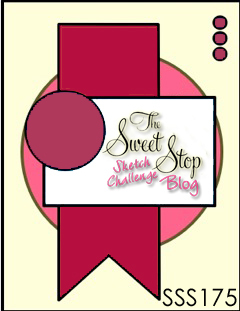 If you would like to be considered, please submit a project using today's sketch and add DT Call after your name when uploading your card using the Linky Tool at The Sweet Stop! Have fun with the sketch...and good luck! I found myself reaching for the beautiful clear stamp set called The Sea from Sweet 'n Sassy Stamps for my sample today! As vast as the sea is that covers the earth, so is God's love for us! This serene image of the ocean reminds me of the peace that the Lord brings to our lives...how comforting! Creative Nugget: I kept my card very clean today with a lot of white space. I followed the sketch for the Night of Navy and patterned paper layers which were stitched to the Neenah Solar White card base. The image was stamped onto an Oval Nestie while the die was still in place using Versafine Onyx Black ink. The image was masked with Post-It notes and sponged with a variety of distress inks to create the clouds and the sunset. A little bit of Baker's Twine was added around the fishtail banners to finish the card! That's all...easy peasy! Check out the other talented Sugar Babies for more fabulous inspiration! We will begin to notify potential new DT members the week of October 1st. I can't wait to see all of your creative submissions and find out who will be joining the Sugar Baby DT! Happy Saturday sketch lovin' friends! It's time for another sketch at The Sweet Stop. I must admit...I feel like I've been stamping non-stop for two days...my sample for today was finished at 2:00 Friday morning! It's very different from my usual style, but I needed a break from creating fall cards...as much as I love the colors and textures of fall...so, you'll have to let me know what you think! Now if it's fall inspiration you want, just scroll back to yesterday's post and hop through Sweet 'n Sassy's Fall Frenzy Blog Hop...you'll be glad you did. The Design Divas really outdid themselves! Creative Nugget: No Copic coloring on this one...Gasp! I started with a piece of Neenah Solar White card stock the same size as the card base. A piece of Yours Truly DP by Echo Park was mounted onto this, and then the Cheery Lynn Lattice die was stitched on top of that. 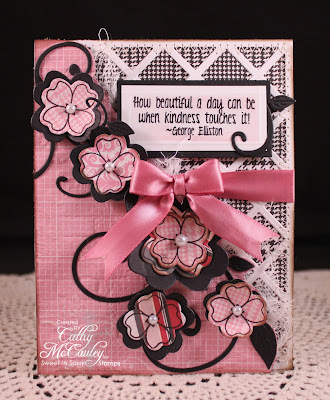 A pink ribbon was then tied on this panel and everything mounted onto the card base. Two of the Cheery Lynn Fanciful Flourish dies were glued diagonally across a coordinating piece of DP. A few Kindness Flower Dies that match the Kindness Clear Stamp Set were cut in different sizes from a variety of matching DP and True Black card stock, and the flowers stamped on with Versafine Onyx Black ink. The flowers were layered and a stylus was used to curl the petals for some dimension. The flowers were then popped onto the flourishes. I hand cut around the flourishes and the flowers to make the diagonal panel. A little cheesecloth (thanks Monika) was tucked behind this panel before adhering it to the card. Some pearls and the sentiment were added to finish the card. I wasn't sure I liked this one, but I think it's starting to grow on me! LOL! Uh Oh...I just now realized I totally forgot the spin for this week. I can't believe I did that! LOL! Just make sure your SSS176 submission at The Sweet Stop has a fall theme and you will be eligible for a prize at the Sweet 'n Sassy Store! 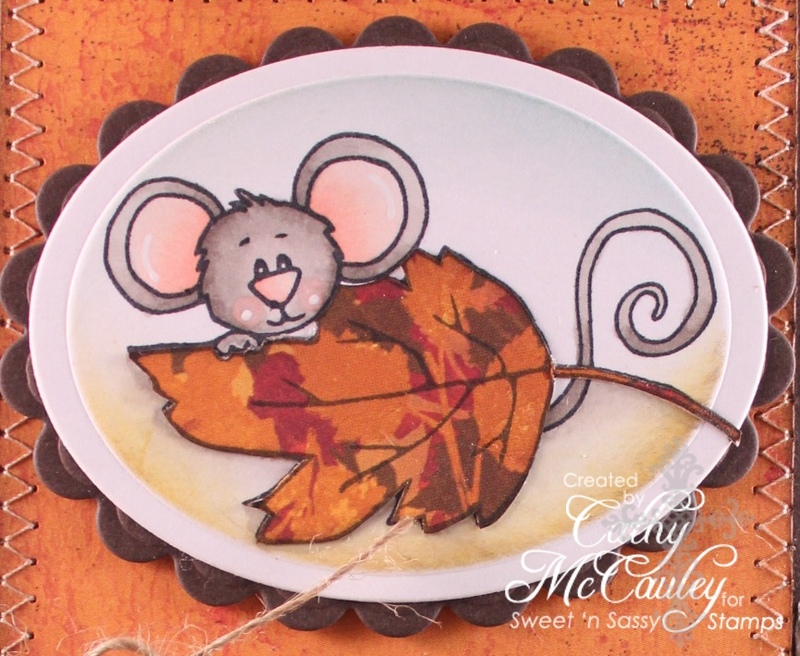 Be sure to check out the wonderful "Fall" projects by the other Sugar Babies! Fall Frenzy Blog Hop & Virtual Stamp Day! 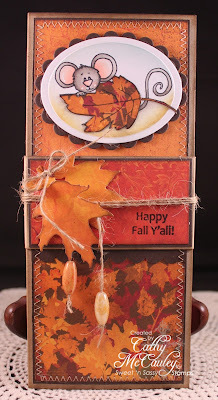 The Design Divas have created some fabulous eye candy for you featuring our wonderful selection of Fall stamps so we hope you'll hop along with us today! Be sure not to miss a single stop along the way because we'll be drawing one lucky commenter from a random DT blog to win a $25 credit to the store!! Creative Nugget: For my first project, I decided to cover a note pad I found in the dollar bin at Michael's. Since the note pad had fall leaves printed on the pages, I reached for the Fall Time Cocoa Clear Stamp Set to make the cover. The pattern for the cover can be found HERE on Nichole Heady's blog. The measurements were changed to fit the note pad. The base of the cover was made with Kraft card stock. 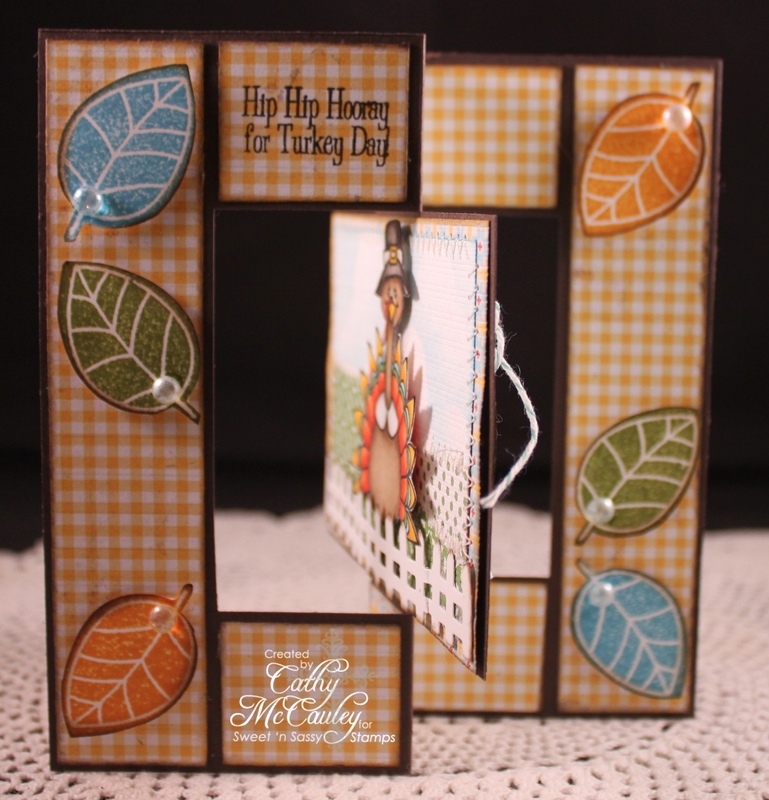 Layers of Dark Chocolate card stock and patterned papers were stitched to the base. Cocoa was stamped on Neenah Solar White and colored with Copic Markers. The leaf was paper pieced using matching papers from the Forever Fall Collection by Bo Bunny. A belly band was made to keep the cover closed. 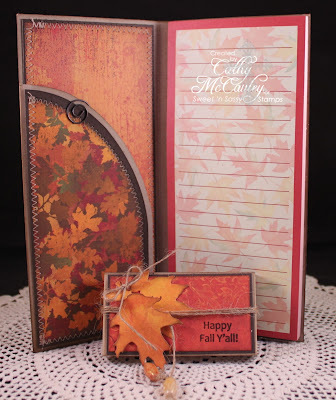 The sentiment was stamped on the belly band and jute, beads, and leaves cut from the Season of Change Leaf Die Set were added. Here is the inside of the cover. 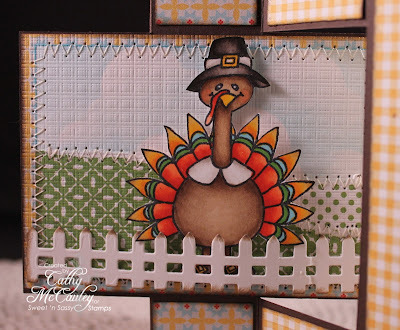 For my second project I used the fun clear stamp set, Gobble, Gobble. This set is perfect for Thanksgiving cards. 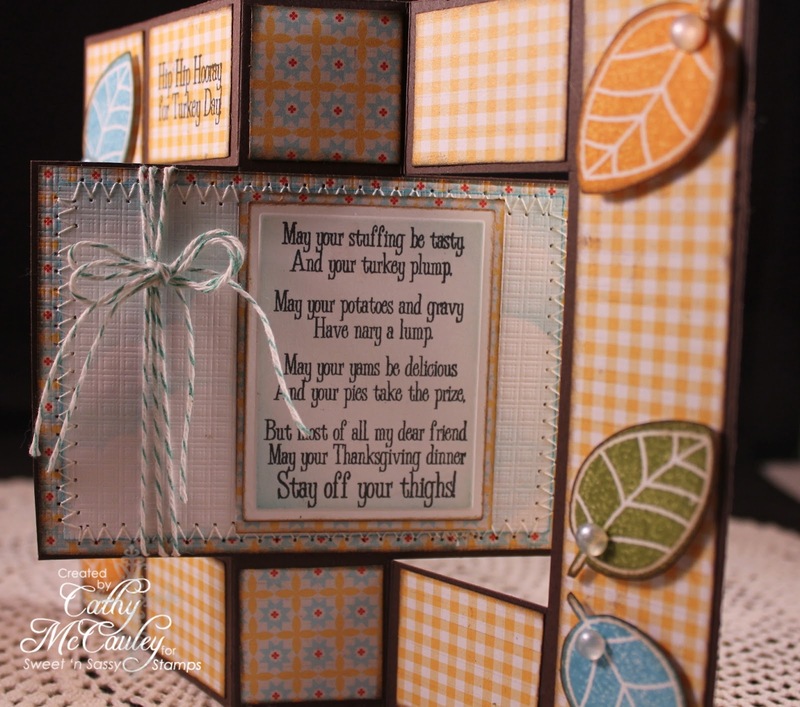 I just love the little Pilgrim turkey and fun sentiments that come with the set! 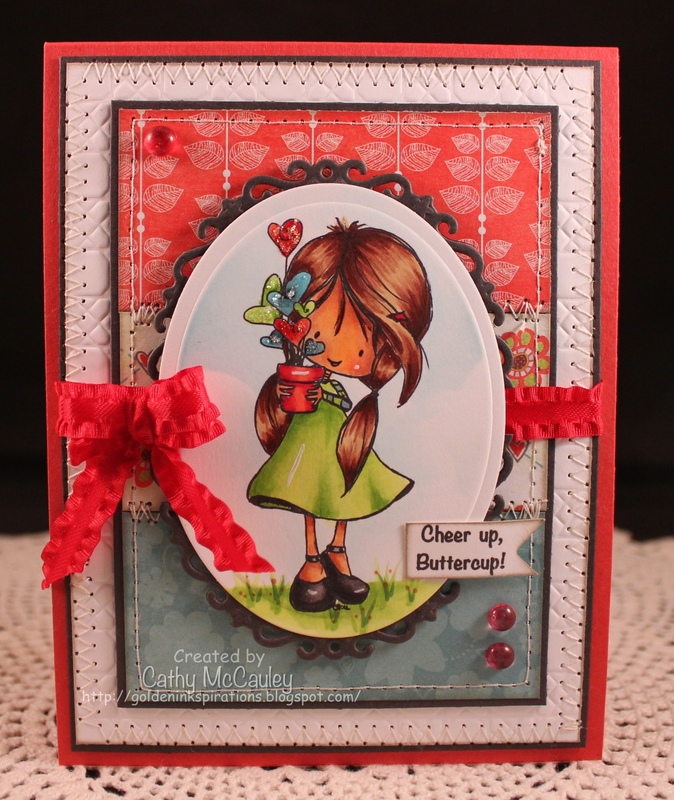 Creative Nugget: The directions for this fun Swing Card, sometimes called a Flip Flop Card, can be found in the tutorials at Splitcoaststampers. I added some paper by Lilybee Designs to decorate the panels along with some leaves from the Leaf Silhouettes Clear Stamp Set. Some dew drops were added to each of the leaves. On one side of the flip flop panel, clouds were sponged on a piece of Neenah Solar White card stock. Hills made from Lilybee Designs paper were stitched to the panel which was then embossed with the Canvas Impression Plate. The turkey was colored with Copic Markers, fussy cut, and popped up on the hills. The Fence Die from the Fence and Grass Die Set was added to the front of the panel. Clouds were also sponged on another piece of Neenah Solar White card stock for the other side of the flip flop panel. The sentiment was stamped, die cut, and mounted to the swing panel. Some Baker's Twine was added for balance. Are you getting excited for Fall yet? I hope you've been inspired by my projects, but there's a lot more goodness to come. Your next stop for more Fall Frenzy is Mary! 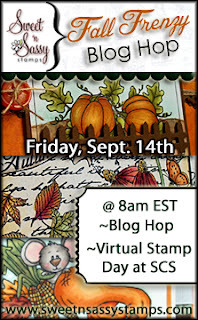 When you're done hopping be sure to join us for a fun day of challenges over in our Splitcoaststampers forum. We're giving away some fun prizes, too, so don't miss it! 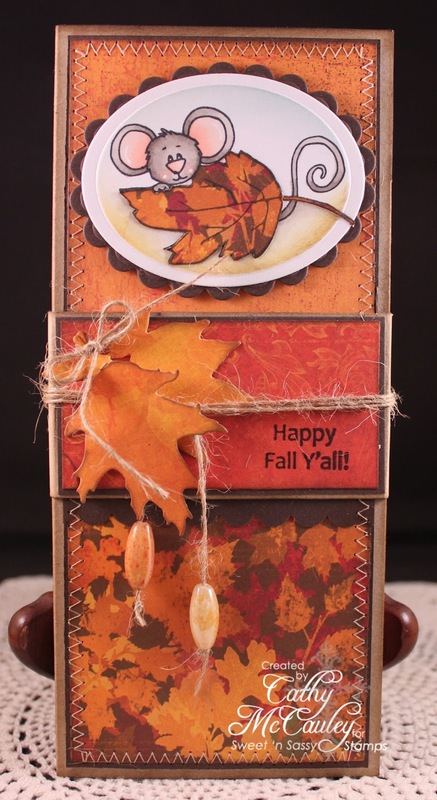 We look forward to seeing your fabulous Fall creations! Thanks so much for stopping by! Have a fabulous Friday! Happy Saturday sketch loving friends! 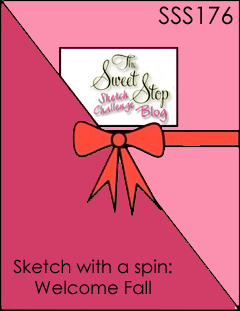 It's time once again for another fabulous sketch at The Sweet Stop! This week's design has lots of layers, so it was right up my alley. 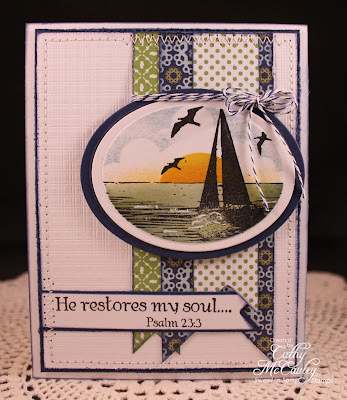 For my sample I combined a variety of stamp sets by Sweet 'n Sassy Stamps, a fall theme, and scripture...thus the title of my post...Fall on Your Knees! Aren't you thankful that in good times and in troubling times we can fall on our knees and our heavenly Father will hear our prayers and supply our needs? 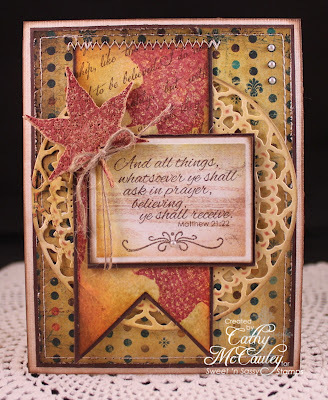 Creative Nugget: The Vintage Cream card base was embossed with the Canvas Impression Plate and distressed with Vintage Photo and Walnut Stain Distress Inks. The DP panel was distressed and stitched to some Dark Chocolate card stock. It seems that every card I make lately has stitching on it...I just love the look and can't make myself put my little sewing machine away! Hope you don't mind! More paper from the Weekend Market Collection Paper Pad by Bo Bunny was cut using the Splendid Circle Die. The fishtail banner panel was made using a Tim Holtz technique called Perfect Distress, which can be found HERE, various distress inks, a leaf image from the Season of Change stamp set and the Friendship Script background stamp. Heirloom Gold Perfect Pearls gives this panel and the sentiment panel a very pretty shimmer which does not show up at all in the photo. 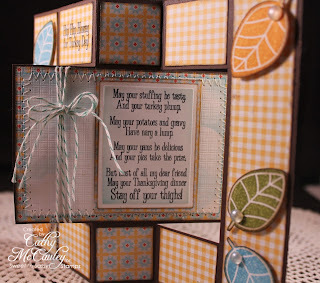 The sentiment panel was stamped with the woodgrain border from the Grunge Borders clear stamp set, the scripture from the Words of Jesus set, and one of the Decorative Frame Toppers. The leaf in the corner is cut from cork using one of the matching Season of Change Leaf Dies and stamped with Aged Mahogany Distress Ink...and yes, the die cut through the cork with no problems! A little bit of jute and some pearls finish the card. And here is the Christmas version using the pre-released Christmas set, Holiday Baubles, and the Light of Christmas background stamp. Now it's your turn...but before you rush off to your crafty place, check out the beautiful samples by the other talented Sugar Babies and leave a little love on their blogs! Can't wait to see what you create for SSS175 over at The Sweet Stop! Hello, and happy Saturday to you sketch lovin' friends! 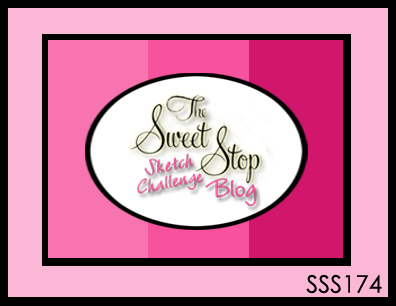 It's the first Saturday in September and time for another fabulous sketch at The Sweet Stop! One of my little cherubs from church had to have her tonsils removed this week, so a combination of the new sketch and a Tiddly Inks digi were used to make the perfect card to help cheer her up! Creative Nugget: The "Wryn - Grow a Little Love" digi from Tiddly Inks, was colored with copic markers, cut with an oval nestie, and mounted to a floral oval die which had been cut in half to fit the image. Several patterned papers from the Alora Collection by Bo Bunny were stitched together on a Smokey Shadow panel. This was adhered to a Picnic Plaid embossed panel and stitched to another piece of Smokey Shadow card stock. All of the layers were mounted to a Rocket Red card front...now doesn't that color bring back old SU! memories! Wryn was popped up on top of a ruffled ribbon and bow. The sentiment was computer generated and hand cut into a little banner. A few dew drops were added to finish the card. This little darling should cheer up my little buttercup, don't you agree? I did change the orientation of the sketch to accommodate my image. 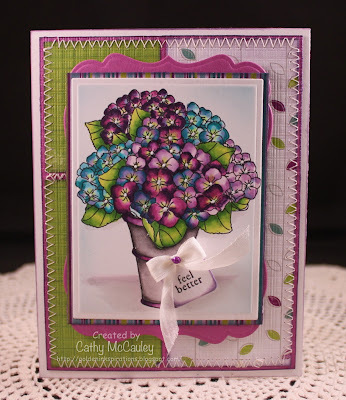 This card was also submitted for the "Ways to Use It" Challenge at Splitcoaststampers this week...Hannah had challenged us to make a card to make someone SMILE! 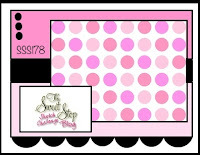 Be sure to check out the wonderful samples by the other Sugar Babies and play along with SSS174 over at The Sweet Stop. Thanks so much for stopping by...have a cheerful weekend!